These 4 Bank Stocks Are Ridiculously Cheap -- But Are They a Bargain or a Nightmare? These prices hardly make sense, until you see the problems facing each of these banks. In the world of bank stock investing, analysts use the price to book value ratio to gauge just how cheap or expensive a bank stock really is. Typically, a price to book value ratio above two is considered expensive for banks while a ratio below one is considered cheap. If a cheap bank's price to book value ratio is below one, then a ridiculously cheap bank stock must trade well below even that modest threshold. And, in that regard, these four banks are about as cheap as you can get. 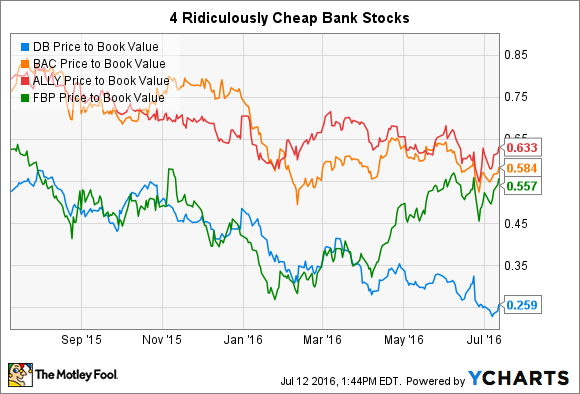 Four ridiculously cheap bank stocks. Of these four banks, Ally Financial (NYSE:ALLY) has the highest price to book value ratio. Don't get too carried away, however. It's currently trading at just 0.63 times its book value. Bank of America (NYSE:BAC) and Puerto Rican regional bank First Bancorp (NYSE:FBP) are a tad worse off at 0.59 and 0.56 times, respectively. At the absolute bottom of the barrel is Deutsche Bank (NYSE:DB) at an almost unbelievable 0.26 times price to book value. Being cheap can be a good thing if the company is operationally sound, but it can also be a sign of serious problems. A price below a bank's book value fundamentally means that investors don't think the assets on the bank's books are worth what the balance sheet says. This could be driven by concerns over asset quality -- loans that may not be repaid as planned, for example -- or it could be a question of the assets' ability to generate earnings in the future. Understanding why the market is pushing down the valuation is critical to analyzing the likelihood that the stock could recover. In the examples here, low valuations are indicative of both specific and market challenges facing each bank. For Bank of America and Deutsche Bank, low valuations start with their sheer size and complexity. Both of these behemoths are considered globally systemically important and each must carry extra capital on the balance sheet beyond the basic regulatory requirements for all banks. Reviewing a list of 65 of the largest banks doing business in the U.S., eight of the cheapest 13 banks have total assets in excess of $800 billion. Being large doesn't by itself mean a bank will have a low valuation, but the pattern is clear. Bank of America's situation is made worse by weak profits over the past five years. On a trailing 12-month basis, B of A's returns on equity are currently just 6.65%. That measure hasn't touched 7.5% since before the crisis. The bank has done an admirable job working through its numerous post-financial crisis challenges, and, in my view, is just missing the final piece of the puzzle, profitability. If they can improve profitability to match some of their higher performing peers, then there's no reason that this stock won't see its valuation improve substantially. Bank of America is probably a bargain at today's prices. In Deutsche Bank's case, the "too big to fail" stigma is exacerbated by two serious, additional headwinds. First, the British vote to exit the Eurozone this past June has prompted investors to hammer European bank stocks in general, and Deutsche Bank in particular. Why the special attention on this German bank? Because Deutsche Bank was in a world of trouble even before the U.K.'s watershed vote. While Bank of America and other U.S. banks have mostly put the financial crisis in the rear view mirror, Deutsche Bank is still struggling with legal and regulatory headaches from crisis-era misconduct, a bloated cost structure, and too much reliance on balance sheet leverage. The stock was down 21.5% in 2015, following a 35.7% decline in 2014. This year, with the added impact of the Brexit, the stock has dropped 41.3% already. In other words, Deutsche Bank has been ridiculously cheap for a while, and even at this price it's still a risky bet -- and a potential nightmare. First Bancorp is the smallest bank on this list, but is facing a comparable geographic headwind as Deutsche Bank. First Bancorp has suffered as the Puerto Rican economy -- its home market -- remains hamstrung from the real estate collapse and financial crisis. First Bancorp's stock has lost 99.1% of its value since its peak in early 2005. The Puerto Rican government isn't helping matters; it's still severely burdened by debt, even after a number of moves to restructure and potentially bail out the island. The island's population is also declining, shrinking the tax base with every outbound emigrant. For First Bancorp, meaningful improvement and a stock rebound will only come once the Puerto Rican economy starts to recover. Unfortunately, that doesn't seem likely to happen soon. Last is Ally Financial, formerly known as GMAC, the lending arm of General Motors. Ally has made strides since its divesture from GM to diversify away from its concentration in auto loans, but the heavy reliance on car loans is still evident today. The company missed earnings expectations in the first quarter, primarily driven by a large increase in its reserves for bad auto and consumer loans. Over the long term, I think Ally's strategy to diversify its loan portfolio, reduce its reliance on auto lending, and de-risk its balance sheet is sound and will create shareholder value. However, in the short term the bank and its investors will have to be patient with today's ridiculously low valuation. I don't think the valuation will rise too far until there is meaningful progress solving the credit problems on display in the first quarter. When it comes to bank stocks, the old adage that "you get what you pay for" is often true. These banks are ridiculously cheap right now, and in each case, the price is driven by genuine concerns about profit struggles, economic headwinds, or balance sheet problems. These banks have the potential to turn their fortunes around, but investors should not underestimate just how tough that process can be.